Lord Rama is the seventh avatar of the Lord Vishnu, and the king of Ayodhya. Born as the eldest son of Kausalya and Dasharatha, king of Ayodhya, Rama is referred to as Maryada Purushottama, literally the Perfect Man or Lord of Self-Control or Lord of Virtue. Purushottam’ means the highest, or ideal man, and ‘maryada’ means the strict code of spiritual and moral ethics which a spiritual man must follow. Lord Rama himself never departed from this code of virtue and righteousness and was the embodiment of it. If everyone would follow this spiritual code then we would be living in Ram Rajya, the ideal state, and everyone would be happy, as they were during Rama’s reign. Rama’s life and journey is one of adherence to dharma despite harsh tests and obstacles and many pains of life and time. He is pictured as the ideal man and the perfect human. It is said that Rama, the ruler was polite and considerate with everyone and strictly adhered to truth and righteousness. Valmiki has given the characterisation of the four brothers Rama, Lakshmana,Bharatha and Sathrughna demonstratiing the four virtues of Saama(gentle persuasion – Lord Rama), Daana(offering material wealth or allowing to happen and forgiving- Lakshmana), Bheda (use threat or warning- Bharatha) and Dhanda(literally means stick – Use punishment or violence- Satrughna) where all the other three – Sama Daana and Bheda method fails. Valmiki advises that a wise man should have all these four virtues while dealing with people. Sita Devi is regarded as the epitome of womanhood and the pillar of strength. She is the symbol of purity.Though Sita’s life was filled with great trouble after getting married to Rama, she never loses her calm and dignity throughout the story of Ramayana. She is presented as the daughter of mother Earth who is ever protecting-the perfect motherhood. Another important character in Ramayana is Anjaneya who symbolically represents pure devotion having implicit faith on his master. He has completely surrendered himself to the Lord and is absolutely non-egoistic. But we can see here that Anjaneya is pictured as belonging to the monkey race which illustrates the animal nature hidden in humans. Lord Anjaneya depicts the restless mind which is monkey like, but quite contrary to this, mind can be brought under perfect and absolute control. The Mind, once under perfect control, cleared of all ill thoughts, makes the body the Kshetra where “Kshetrajna – The Lord Resides”, just like Lord Rama resides in the heart of Anjaneya. 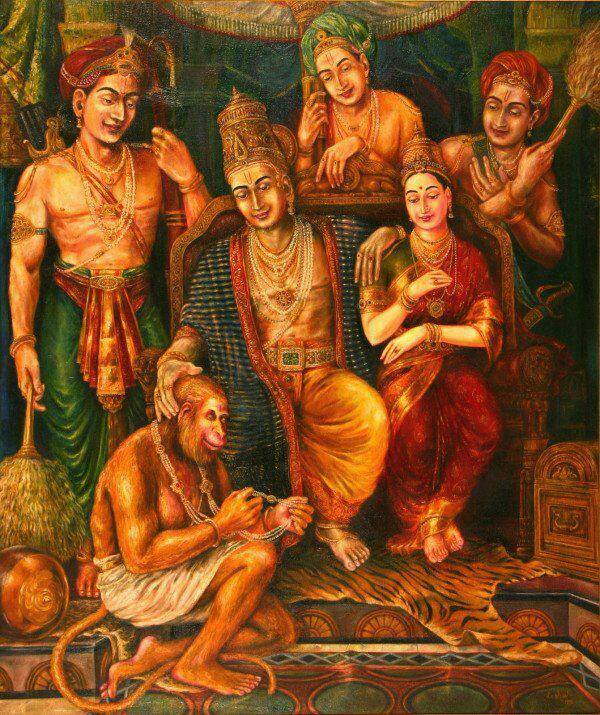 Valmiki makes an exemplary character in Anjaneya explicitly saying that “mind under perfect surrender and devotion to Lord can achieve wonders as illustrated by Anjaneya in the epic Ramayana.. Comparing Sita to Jeevatma(the Individual Soul) and Lord Rama to Paramathma(Universal Soul), Anjaneya takes the role of uniting the Jeevatma to Paramatma and this He does keeping Lord Rama in front of all the actions he does, offering all the fruits of his work to the Lord – which is nothing but the Karma Yoga as illustrated by Lord Krishna in Bhagavad Gita !! Let us take a few tips in this Ramayana Month from the epic Ramayana as to how to live, listening to the wise words of Lord Krishna as said in Bhagavad Gita ..
dear madam, thank you for the nice write up. this month is celebrated as Ramayanam month in Kerala and people read ramayanam daily during this month. Play back singer Smt K.S. Chithra has come up with an album of songs on Sri Rama. divinely nice piece of write up . GOD BLESS US ALL .